At this early stage in the life of Core 2 Duo, its full power is yet to be seen. For now, the AJP M575U is a strong gaming laptop with an eye on the future. To get its Core 2 Duo systems to market in the shortest possible time, AJP has built the technology into an existing model in its range. Providing dual-core gaming power from a desktop replacement chassis is the AJP M575U (£1585 inc. VAT). Despite using one of the lower-powered processors in the Core 2 Duo range, performance is still strong. The T5500 chip runs at 1.66GHz and is backed up by 2048MB of memory. Even the 100GB hard drive spins at the fastest possible speed of 7200rpm. With the technology so new to market, benchmark software has yet to be optimised. As a result, test scores were below what we were expecting. With a MobileMark 2005 score of 201, performance is adequate, but less than we've seen from Intel's dual-core chips. Equally, dual-core Cinebench tests showed power far below expectations. Day-to-day performance proved competent, but it should be noted that the full power of dual-core technology won't be realised until more software utilises the twin processors. Gaming ability represents the core goal of the AJP. Using nVidia's GeForce Go 7900 GTX graphics card, 3D performance is outstanding. Scoring 15,364 points from 3DMark tests, all gaming and multimedia applications run with ease. The 17-inch screen provides a stunning canvas for such 3D power. With its Super- TFT coating, colours are vibrant. A high resolution of 1920 x 1200 pixels ensures images are sharp and games can be played at full resolution. Predictably, mobility is secondary. With dimensions of 398 x 275 x 58mm, the AJP weighs 4.3kg. 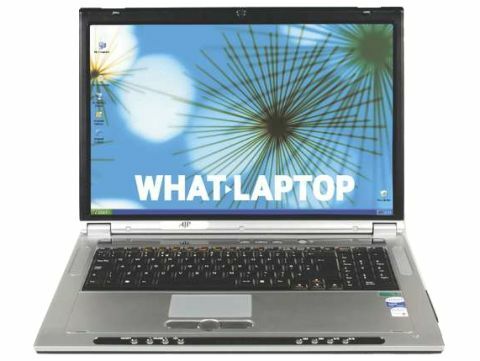 Impractical for daily travel, its battery life of just 113 minutes ensures this is a laptop best suited to a life at home or in the office. As a result, usability is enhanced. With a keyboard that measures 338 x 107mm, there's ample space for comfortable typing and a full number pad is included for gaming and data input use. All keys are responsive, but too firm for long periods of speed-typing. Rounding out the comprehensive specifications of the system is high-speed network connectivity. Gigabit Ethernet suits home networking and LAN gaming, while 802.11a/b/g Wi-fikeeps users wirelessly connected in the UK and even abroad.